We decide to dial the vitriol knob back several notches for this episode and just talk about our favorite games. Obviously, that can’t be done without extensive conversations about Mother and Final Fantasy, but there are a few surprises mixed in as well. 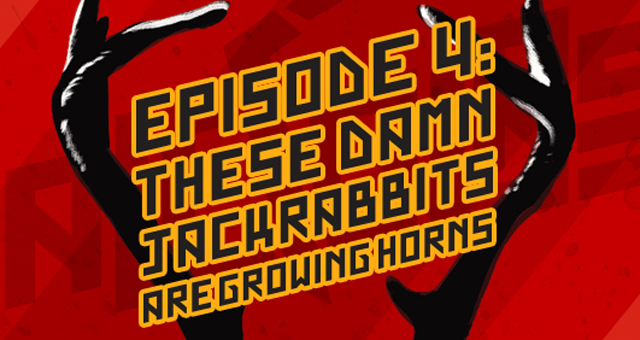 Also, Nate spots a jackalope, Josh shoots a jackalope, and Mandi sciences a jackalope. Keep the conversation rolling by telling us about your own favorite games on Twitter. And stop back to get new episodes every Wednesday. You can see a full list of games we mentioned in this episode at the official Half-Glass Gaming website. BACK IN BLACK! Top album that one. Man, I live ‘in the night’ whenever I can. I don’t like people in general, and I actively hate my neighbours. I’ve probably been nocturnal more than diurnal in my adult life in the times when I haven’t been employed locally. I love the night, because I can just get stuck into a task without various ‘persons from Porlock’ interrupting my creative process. Mother3 sounds AWESOME, I’ve never played it. I loved FF7, but I the amount of unskippable cutscenes make it hard for me to reply it. Never played Crisis Core or anything like that. The Reverends comments about Child Of Light reminds me of the ‘Extra Credits’ take on how to write a good female character: “Just write a good character, because gender shouldn’t matter if you do right”. I’ve never played Red Dead, but I heard good things about it. My favourite Retro game is probably the Amiga Sonic clone ‘Zool’. Keep up the great work, gang! Nintendo has made playing Mother 3 much harder than it ought to be, but it’s definitely worth the trouble. There’s nothing else quite like it.